One of New Jersey’s most valuable agricultural communities is located in Cumberland, Gloucester and Salem counties within the state’s Delaware Bayshore region. The area has been recognized by the State Farmland Preservation Program for its high-quality agricultural soils and the fact that the farming culture in this area is under intense residential development pressure. Sprawl is creeping with increasing momentum into this area, with thousands of residential housing units already approved for development in the watersheds of Raccoon, Oldmans and Alloway Creeks, as well as Salem and Cohansey Rivers. The time for preserving critical farmland in southern New Jersey’s tri-county farmland region is now. In 2006, New Jersey Conservation Foundation became the first non-profit organization in New Jersey to receive and use federal Farm and Ranch Lands Protection Program funding to preserve farmland in New Jersey. Over the past decade, New Jersey Conservation Foundation has received over $10.4 million in federal farmland preservation grants to protect nearly 3,500 acres in this vital area. In all, New Jersey Conservation Foundation and its regional preservation partners have protected over 9,750 acres of farmland in the Tri-County Farm Belt. 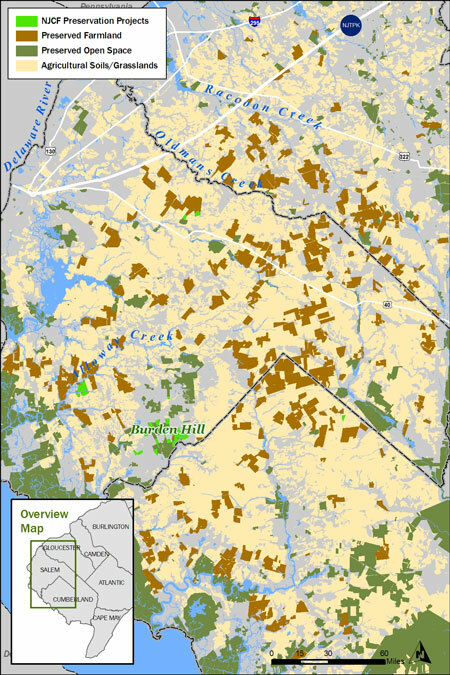 We are currently working with several county and local governments to our to preserve thousands of additional acres of agricultural lands in this important region. The viability of farming in New Jersey is impacted by many issues, including government regulation, development pressures and the economics of the marketplace. The partnership has identified the major problems facing agriculture and we are evaluating steps that could enhance agricultural profitability. Our goal is to help keep farmers farming! To further that goal, in 2008 we launched the Salem County Agritourism website in cooperation with the Salem County Board of Agriculture, the first agritourism promotion effort of its kind in the county. The site features information on dozens of farm markets and other agricultural destinations. The Delaware Bayshore spans southwest New Jersey and is bordered by the Delaware River and Bay and the Atlantic Ocean and is best known for its vast wetlands and associated wildlife. 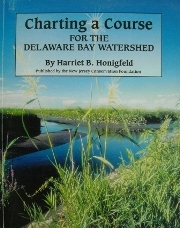 New Jersey Conservation Foundation has led conservation efforts in the region for two decades, starting in 1997 with the publication of Charting a Course for the Delaware Bay Watershed, the first comprehensive planning guide for the region. New Jersey Conservation Foundation and its preservation partners have saved almost 20,000 acres of farmland, wetlands and forested areas in the region. The Delaware Bayshore is under increased development pressure due to rising demand for residential housing for workers commuting to Philadelphia and Wilmington. The Bayshore offers resting and feeding grounds for more than a million migrating birds each spring. The shorebird population that gathers on the Delaware Bay each May and June is the second largest in the Western Hemisphere. American egrets, great blue herons and other water birds typically found in the region are declining due to loss of wetlands and the development of shoreline areas. For more information about NJCF’s preservation work in the Delaware Bayshore, please contact Regional Manager Francis Rapa at 856-823-1021 or fran@njconservation.org.